International Travel Writer and Photographer who considers herself a global citizen, sharing the world with her readers through her travels. I know it's just September, but Halloween will be here before you know it. 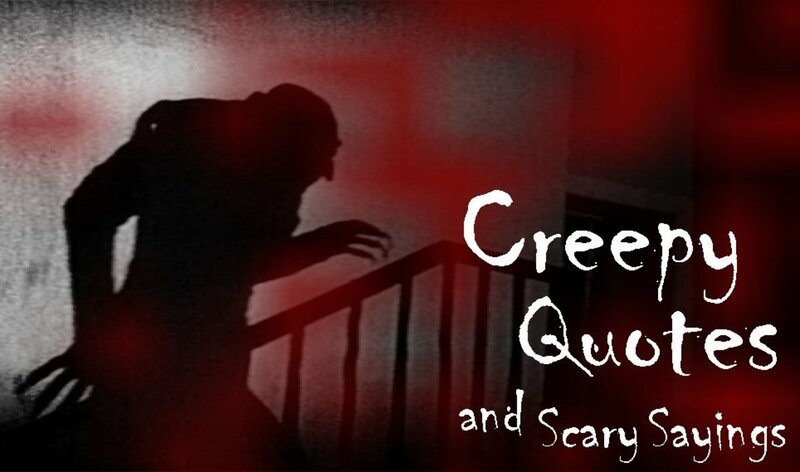 It is approaching, and it is approaching fast, when all the little goblins and witches and warlocks walk the street in search of little treats, and maybe perform a few tricks of their own. New products from the beyond grave line the aisles and shelves of stores. Fresh coffins, tombstones, spider webs, black birds and skeletons are piled high onto shelves. Cobwebs drape the windows teeming with hideous spiders. There are decorations for the ghoulish sorts....not for the faint of heart. It is believed that in total, 170 million Americans, or 71.5 percent, plan to celebrate Halloween this year according to the National Retail Federation's 2012 Halloween consumer spending survey conducted by BIGinsight. "By the time Halloween rolls around each year, it's safe to say Americans have already spent two months preparing for one of the fastest-growing and most widely loved holidays of the year," federation President and CEO Matthew Shay said. Wreaths: A huge trend in home decor. Wreaths have become a HUGE trend in home decor and we love it. A well done wreath adds instant curb appeal. 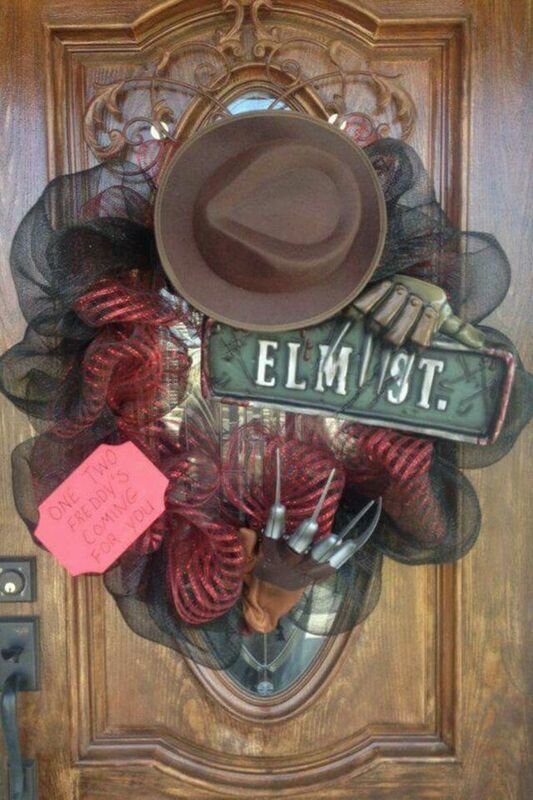 Wreaths are an easy way to dress up your house for any occasion, just put a hook on your front door and you’re done. 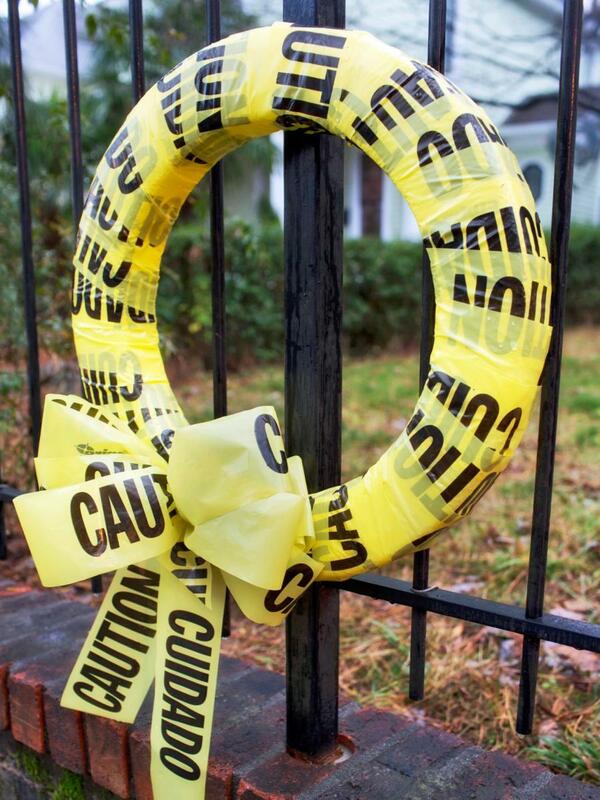 Wreaths don’t damage your home in any way (think Christmas lights and nail guns). Wreaths can be store bought or homemade. Wreaths can be very inexpensive. Wreaths: They're not just for Christmas anymore. 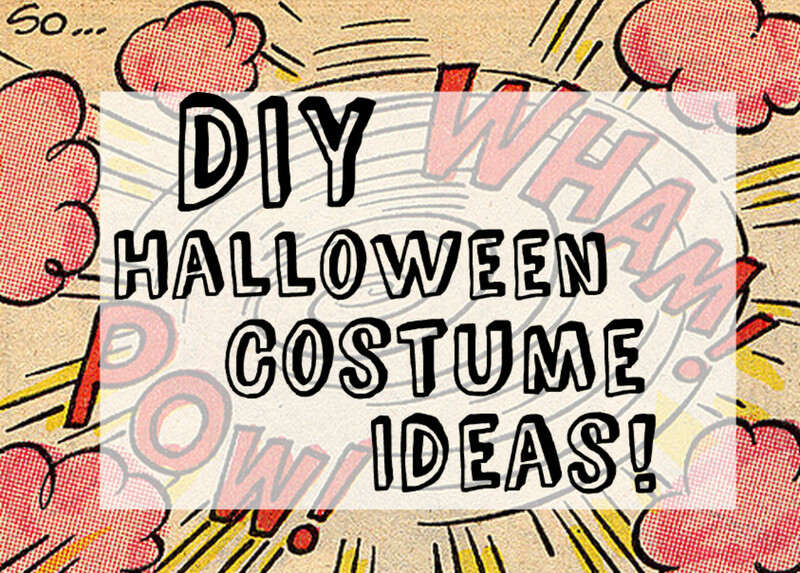 Want to create some Halloween ambiance around your home? 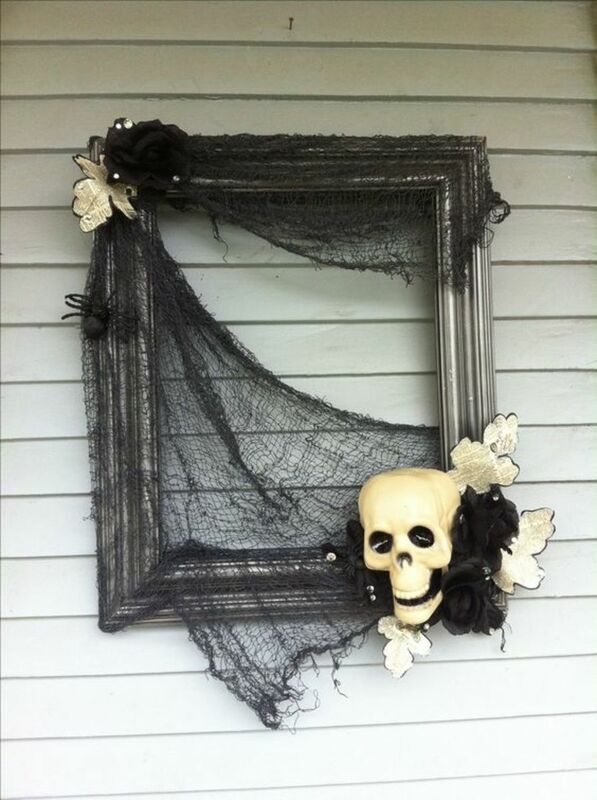 A DIY wreath is a perfect way to get the Halloween look without spending too much time decorating with skulls, candelabras, and other spooky interior decorations. Many of these wreaths can be: made in a few hours or less, and the majority will cost you very little money to make. Get ready to craft a whole lot of bang for your decorating buck. 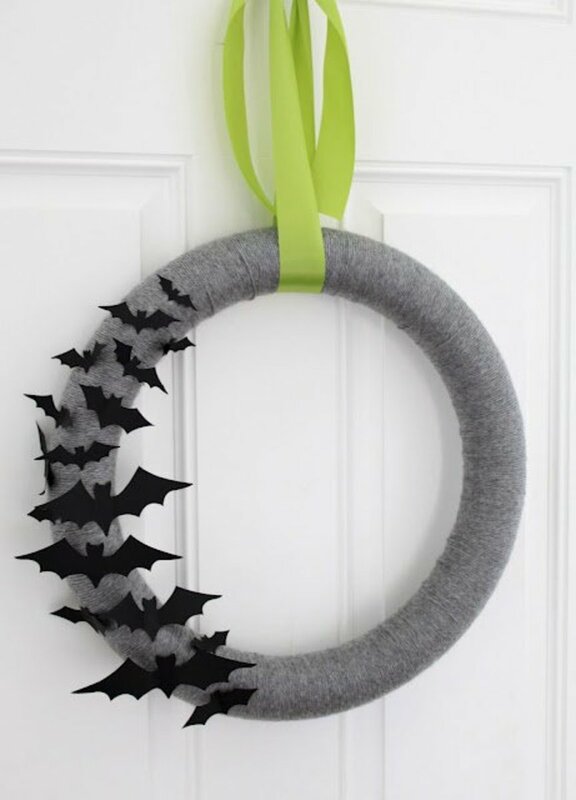 If you’re looking for some fun Halloween decorations for your apartment, but don’t want to spend a lot of money, these DIY Halloween wreaths are a perfect solution. If you purchased your Halloween skeleton already assembled, the first step will be to disassemble it. Lay out the bones to get a feel for the shapes and sizes of each bone. If you don’t want to take the time to disassemble a skeleton, you can purchase a bag of bones that will be ready to go right out of the bag. Dry stack the skeleton bones in a circle to get an idea of how they will fit together and form a wreath (the flatter pieces such as the hips and hands make a good base, with other bones on top). 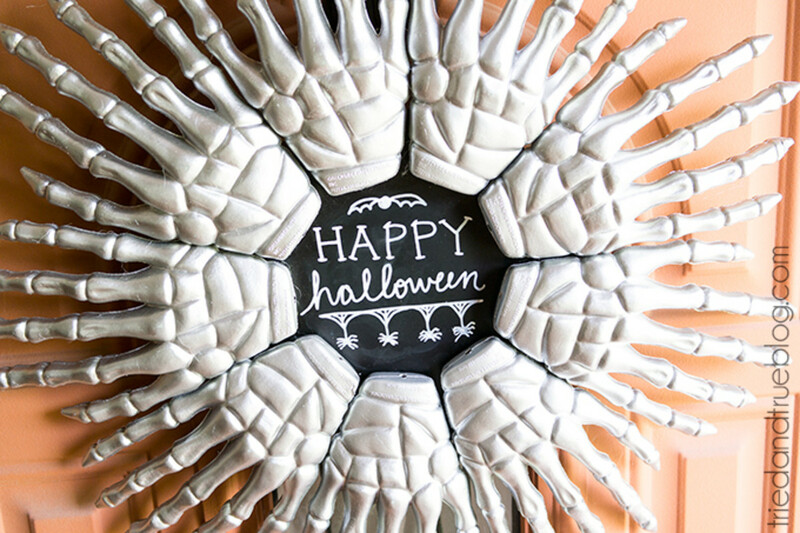 If you want the skull to greet your guests, arrange it prominently at the top of the circle. Begin with one bone and start gluing them together where they touch another bone, until all the bones are secure in a circle. 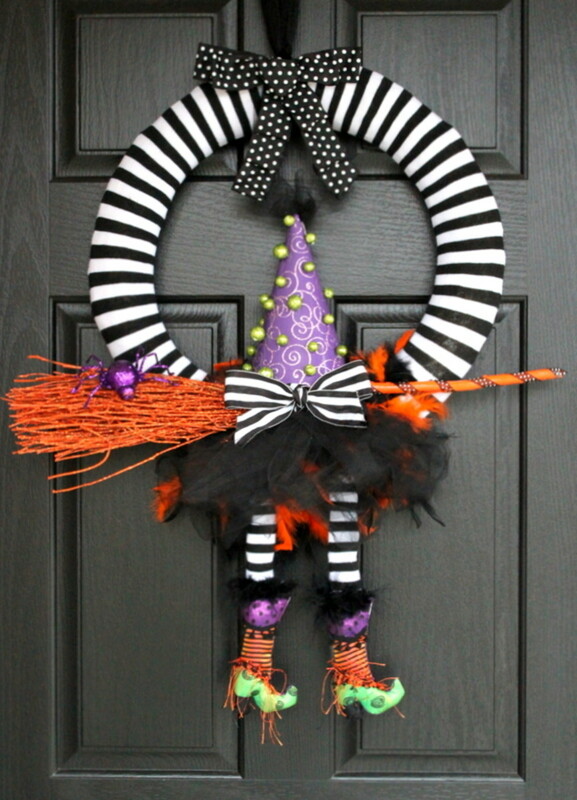 Allow the glue to dry completely before attaching a ribbon to the back of the bones and then hang it on your door. 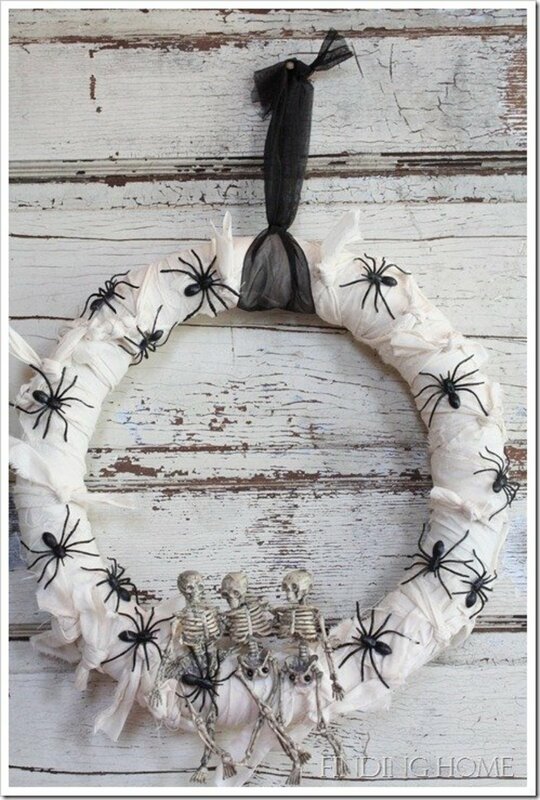 You can embellish your skeleton wreath with fake bugs, jewels and some rope. With your wreath laying on a flat surface, position your snakes onto the wreath. 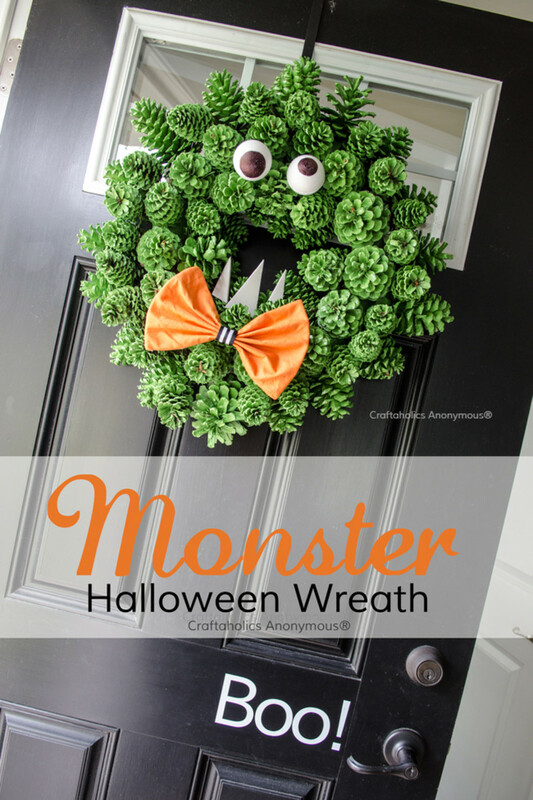 Once you have them in place, hot glue them to the wreath. 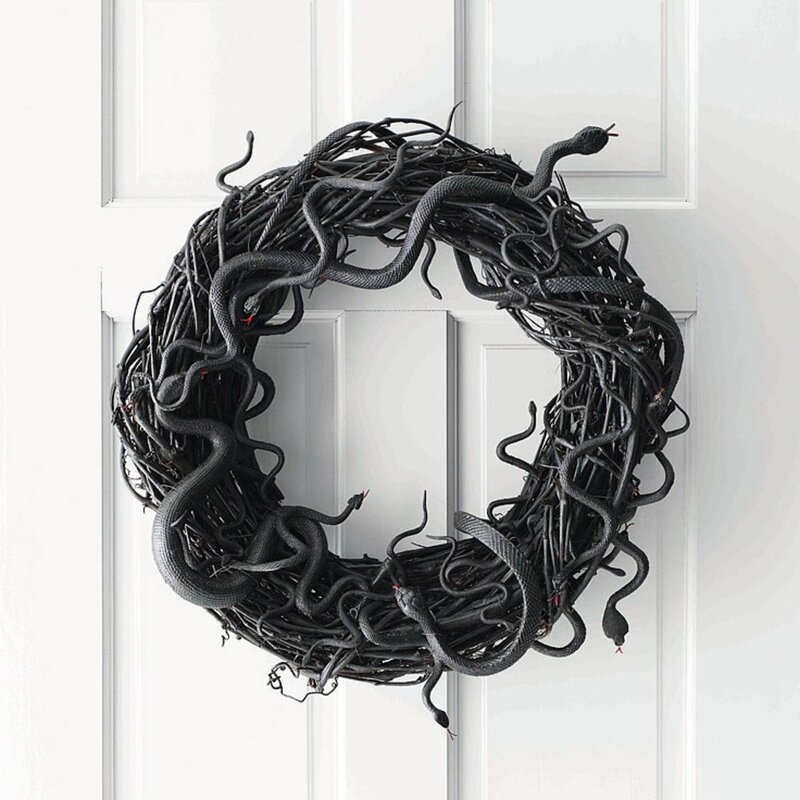 Spray paint the entire Halloween wreath and the snakes with gray paint so they all blend together. 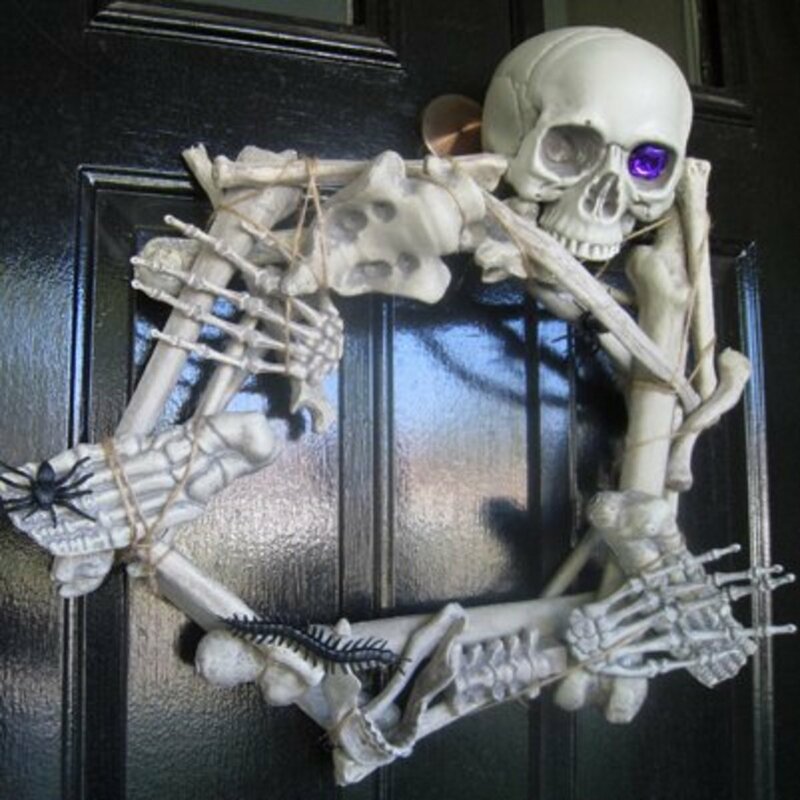 Attach a ribbon to the back of your Snake Halloween Wreath and hang it on the door. This was the first Halloween wreath that I made. I had bought a bunch of things to decorate for Halloween, among them a bag of snakes. You can purchase the spiders, pumpkins and ribbon from the Dollar Tree. This project will cost you less than $5 to make. 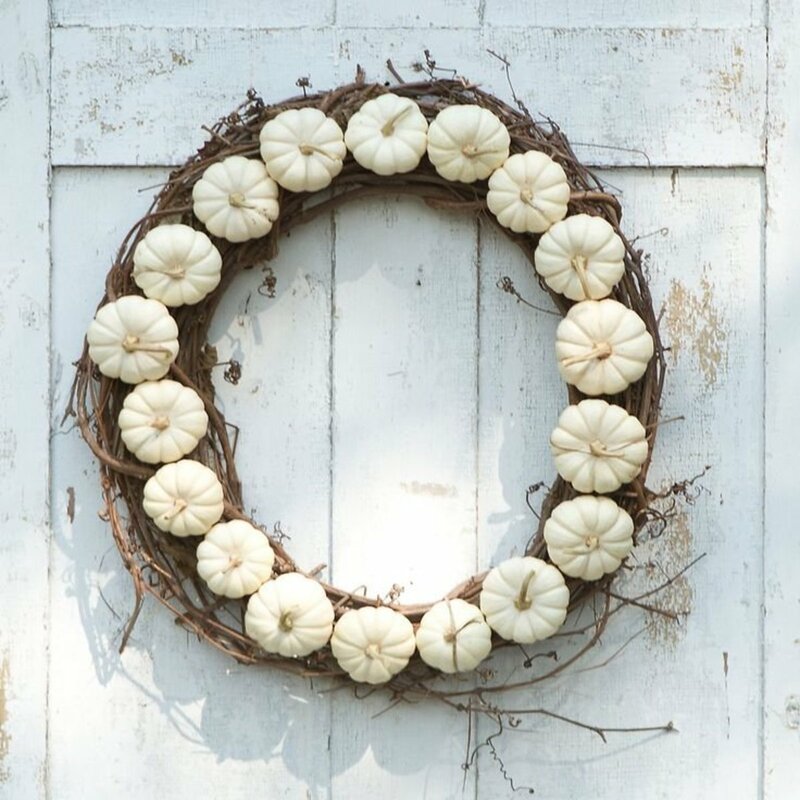 I chose to make this wreath with artificial pumpkins as I did not want to deal with the real pumpkins rotting, and the clean-up. 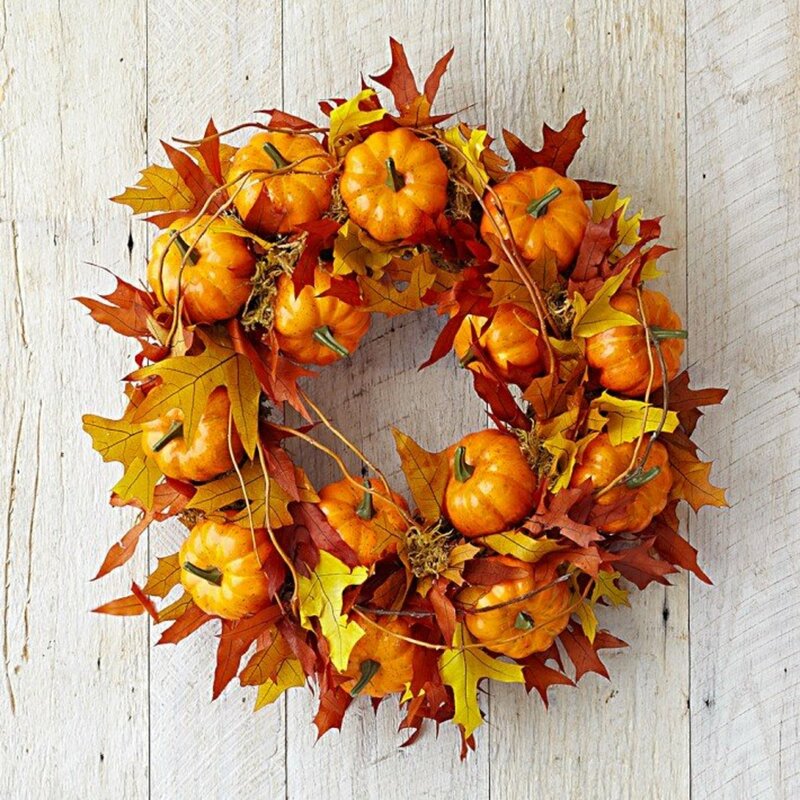 Begin by laying the mini pumpkins on the wreath to get an idea of where each pumpkin will fit the best. After the pumpkins are laid out, glue each one down until there is a layer of pumpkins along the entire front of the Halloween wreath. Glue down plastic spiders intermittently on the pumpkins. 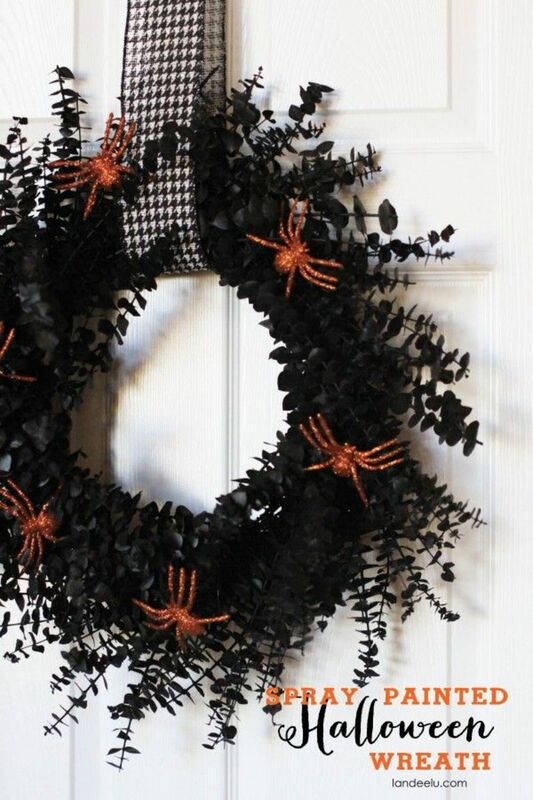 Glue a ribbon onto the back of the Pumpkin Halloween Wreath and attach it to the door. Wreath made using single color pumpkins. You can change this up to suit your decor or your design scheme. Leaves and twine were interwoven into this design. 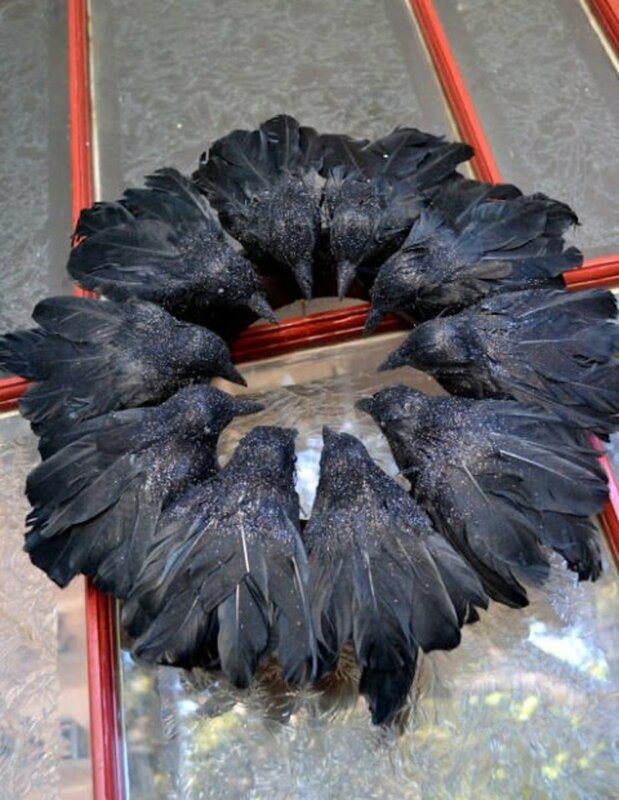 You may to do some searching in costume stores to get the parts required to make these wreaths, but I know the results and the search will be worth it. 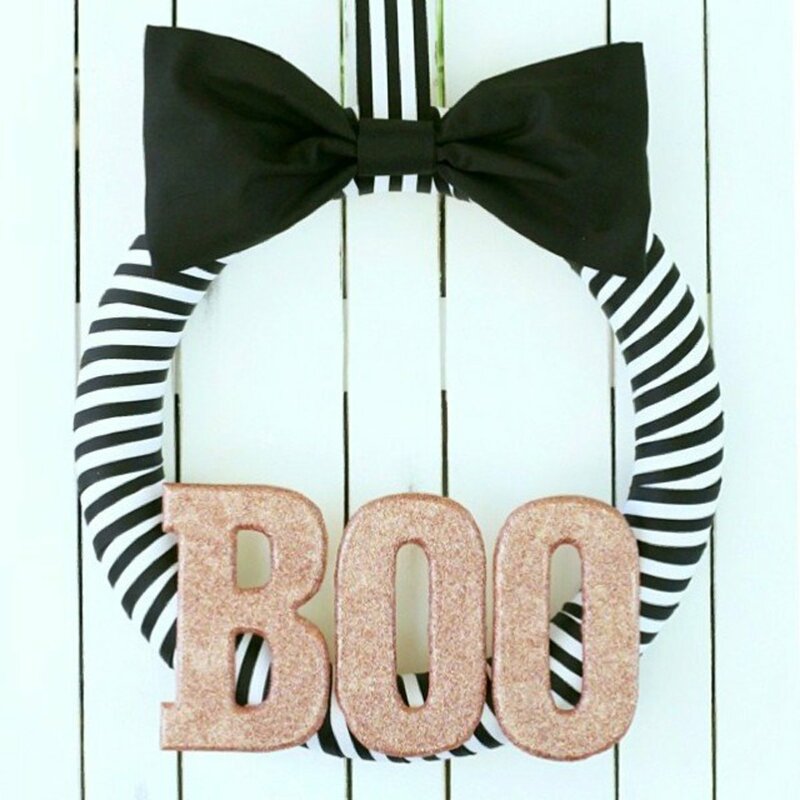 First thing you will need to do is to wrap your foam wreath form with the black and white striped ribbon. I like to pin the ribbon on to my wreaths so that I can reuse my wreath forms, saves a ton of money. For the full tutorial, go here. Create outside the box. Who said a wreath had to be round. Let your imagination run wild with this one. Let your imagination go with this design. Creepy crawlies to add to it. See here for the full tutorial. For the full pinecone monster wreath tutorial go here. Valentine's Day (I know it's technically not a holiday.! 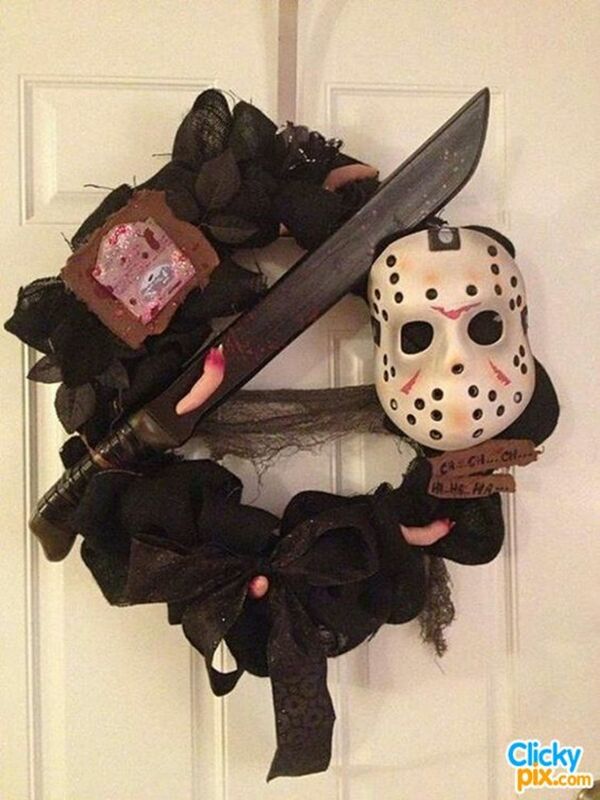 I saw this wreath on Etsy, but it is no longer available. However, it is very easy to make. 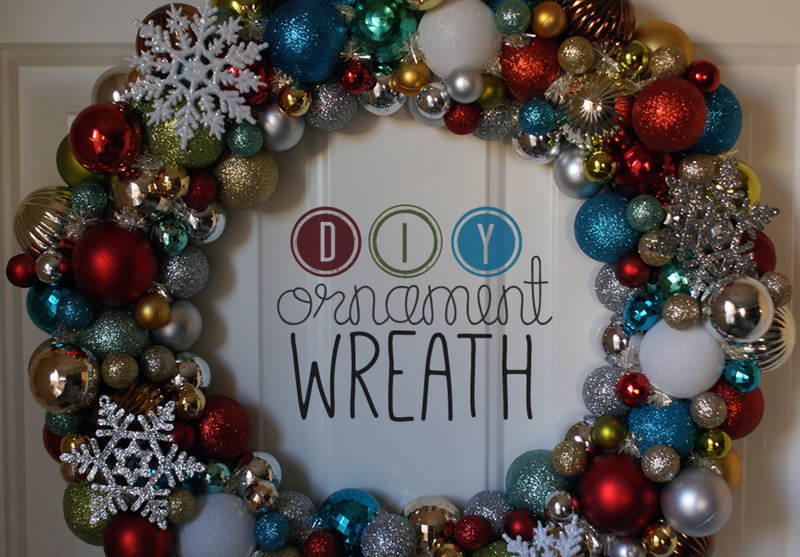 Once again, this wreath is super easy as well. 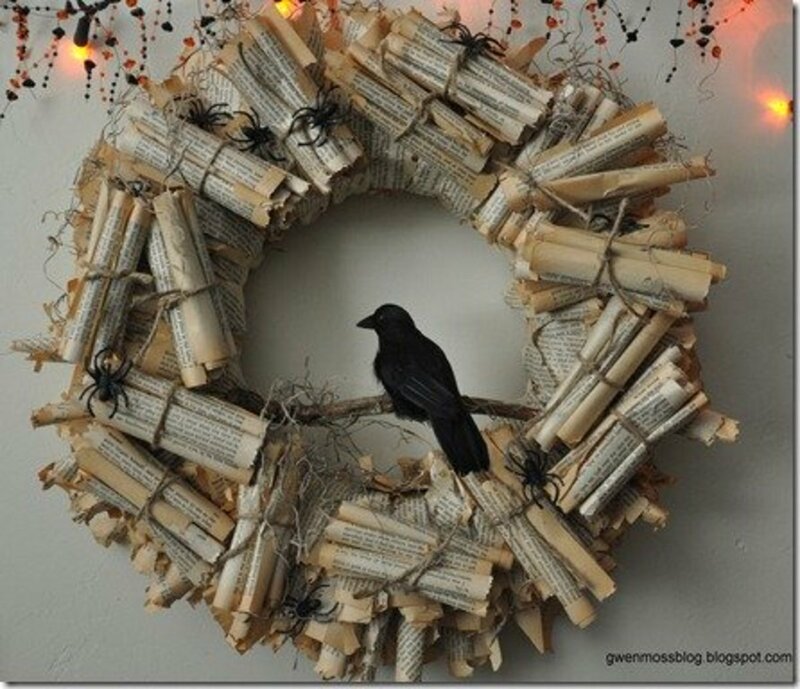 Start with a wreath form, whatever you find cheap. Wrap about 2” wide strips of fabric around the wreath form till it is covered. Then, go back in and use smaller short strips that you tie on to give the look of wrapped mummy. A few creepy items to hang in the center. You can use the hands like in the photograph, or you can choose your own creepy-crawlies. 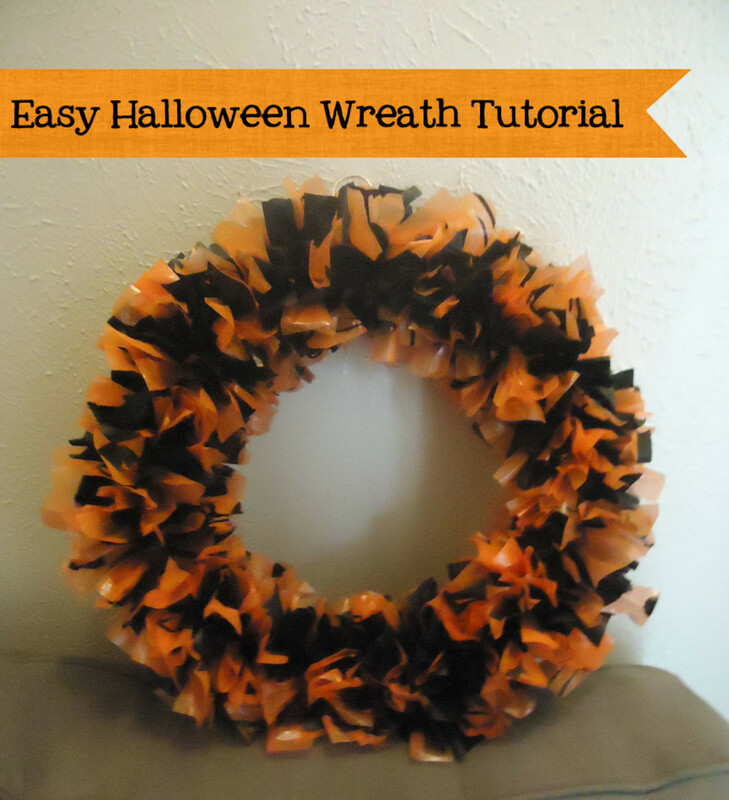 Secure one end of the cheese cloth or gauze fabric onto the styrofoam wreath. 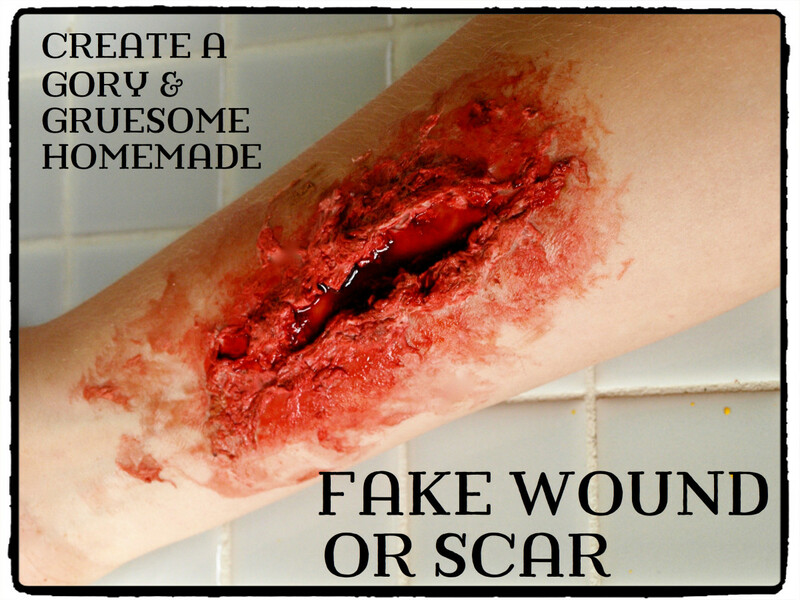 Wrap and wrap the gauze until you get the mummified effect as in the photograph. Once you have achieved the desired look, simply secure the last end of the gauze. Use ribbon to decorate the top of the wreath, as well as to hang the wreath. If you want, you can add plastic spiders or centipedes to the gauze for additional creepy effect. Secure the centerpiece, and hang on your front door. 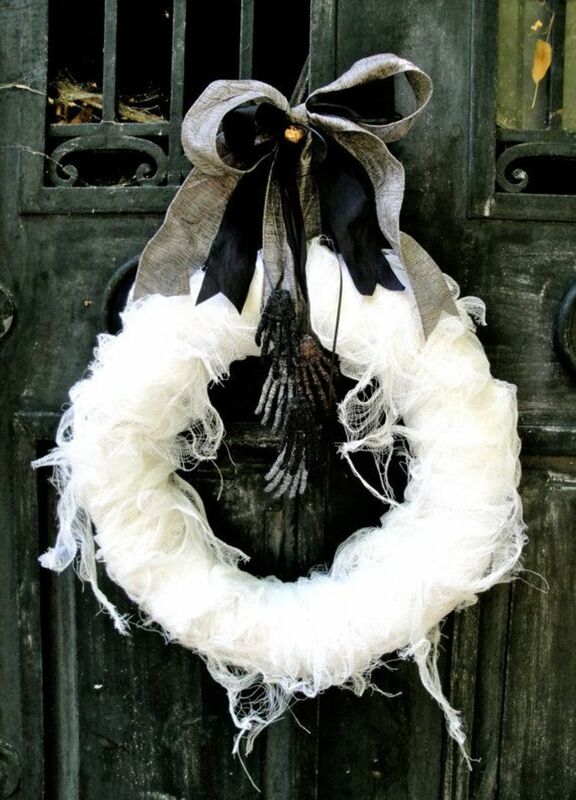 This mummified wreath was done using a muslin type fabric that was torn by hand to get the rough edges. Again, special effects were added using plastic spiders and skeletons. For the full tutorial go here. The author did indicate that it was really annoying to wrap the yard. My suggestion would be to use ribbon to do the wrapping. What's your favorite part about the Halloween season? The movies that come out. Thanks. Good to know. My Prayers are always with you and your family. I see your pic when I sit at my shrine a.m... daily. In our Beloved's Heart of Light and Beauty. Shalom! Hi Manatita. I agree. 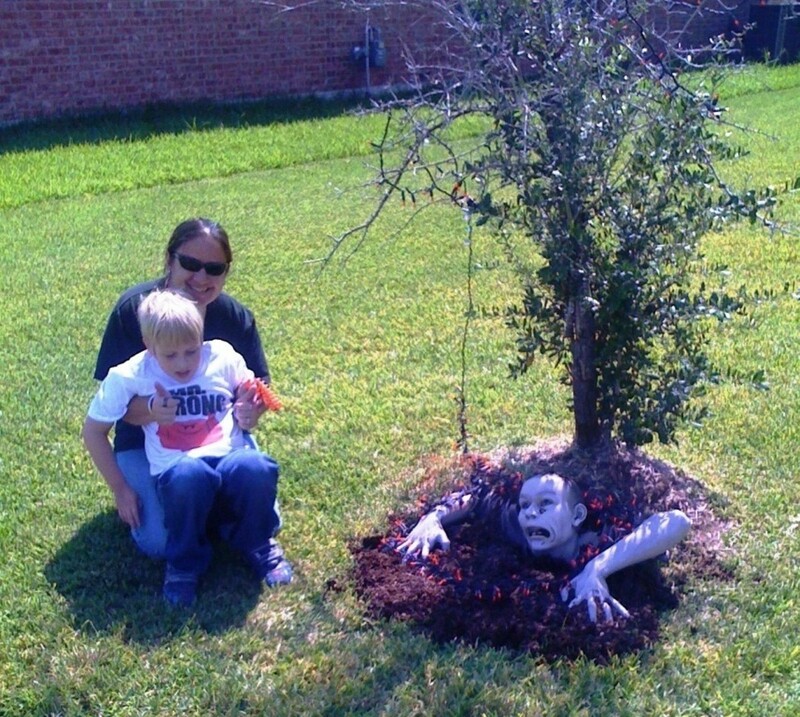 This is all creepy stuff, but some people really get into this day called Halloween. I don't. I love to go around and see what others have done as far as decorating, though. The last couple of days have been a bit of a challenge, but I am recovering well. Surgery took place on Wednesday, and I am finally beginning to feel better today. Thanks for asking. Hope you're well. Much love! All very scary stuff. Definitely not me. 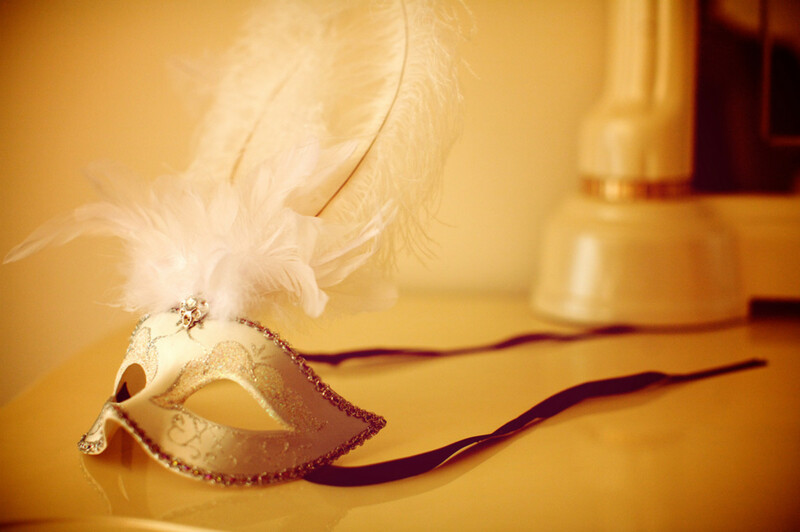 But if it's a question of writing and portraying or celebrating an idea or event, then you've done this well. I note it's Saturday, the 17th. 3 days post... How are you, my Dear?